Playoff hockey is a thrill to watch. The intensity of the game is taken up several notches from the regular season, the skill level is better and the hits are harder. After watching the Penguins beat the Flyers in the first round, a pretty intense rivalry based on last season's Eastern Conference match up, I knew that the second round would be even more intense. Last Tuesday I went to bed before the Carolina - New Jersey game was over, so I was still not sure who the Penguins would be playing next. What I did know, was that the Capitals had won their Game 7 that night. I woke up the next morning to a text from Matt, saying that Carolina had won. I then knew that the Pens would be taking on an even bigger rival in the Capitals. This excited me since I live in DC!!! I would potentially be able to get tickets to 4 of the games because the Caps have the home ice advantage. I immediately emailed Jen, who shares season tickets with her friend. She said that they could not make it to Games 1 or 5, but they were planning on going to Game 2. So I bought the first game from her and the second game from a guy on Craigslist. As you know, if you aren't living under a rock, the Caps have won the first two games. This does not worry me. When I was filling out my playoff bracket, I picked the Pens - Caps series in this round to go 7 games. Therefore I knew that the Pens would have to lose 3 games. What is most frustrating to me about these losses, is that I was there to see them both. I think that of all the major sports, hockey seems to have the most superstition involved in it. I am really not a superstitious person. I don't think that just because I didn't do something, my team lost for that reason. I am not sure how many of the players believe in that, or if they just really like being in a routine. However, it is the playoffs, and things are magnified here, so this got me thinking. I looked back on the hockey games, specifically Pens games, that I have gone to this year. (Un)fortunately, there haven't been many of them. The parentheses are at the front of the previous sentence because my record in person this year is 0-4. The worst part of that is, 3 of those games were against the Caps. As I said, I am not superstitious, but that record makes me think... When the Pens do force a Game 5 and potentially a Game 7, do I want to be in the Verizon Center???? This is making me very conflicted... I don't feel that just because I have been at the losses, it has anything to do with me. However, when it comes to the playoffs, you have to pull out all the stops. Therefore, I am really leaning towards not going to another game against the Caps. What do you all think? Am I being crazy, or do I have a valid argument??? This is a tough one, Tyler. I am not a big superstition believer either but your record concerns me! On the other hand I would hate for you to miss what could be a great game! 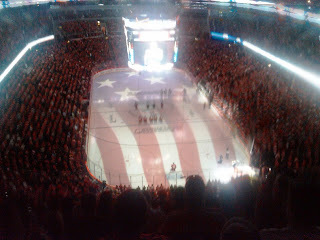 I say that if you have the means to go to the Verizon Center for Game Seven...GO! It just might be an awesome night for you. Stupid Carolina. Still bitter about that one!